« FreeRover, steering motor not needed? This post introduces NXT2excel, a pc utility that allows one to send data from a NXT program to excel over BlueTooth. NXT2excel runs on the pc. 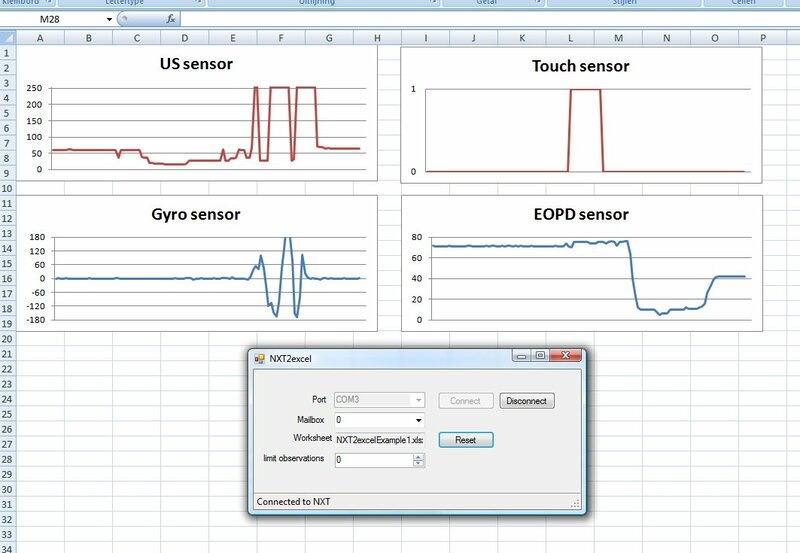 It initiates a BlueTooth connection with a NXT and writes data it receives from the NXT to an excel spreadsheet. This allows the user to examine or process the data. Users can automate the processing of the data with the use of a previously built worksheet. This makes it possible to have treal time graphs. Disclaimer: NXT2excel is in beta stage. It might not always work as expected, it sure is not fool-proof. Use it at your own risk. NXT2Excel is not working with NXT-G! Currently it will only work with robotC. It is very important to terminate the NXT program before terminating the Bluetooth connection. If not, the Bluetooth connection cannot be terminated normally and the NXT will have to be shut down and started over before BlueTooth can be used again. Port: The port number of BlueTooth. Please note that the PC and NXT must already have been paired. Connect/disconnect: Open or close a connection with the NXT. Please open a connection before starting the NXT program and close it after terminating the NXT program. Mailbox: The number of the mailbox the NXT is sending messages to. Worksheet: The Excel worksheet that will be used for writing, read only. The worksheet has to be opened from Excel, after opening the worksheet one should press the reset button. Reset: Press this button after opening a worksheet. The reset button will tell NXT2excel what worksheet to write to. It takes the worksheet that is active when pressing the reset button. Limit observations: By default NXT2excel will add a new row in excel for every received message. The excel worksheet can grow very large as a result. By limiting the number of observations one tells the program to remove observations that are older than the limit. As a result Excel only contains the N most recent observations. Data is sent from the NXT using messages. By design a NXT message can contain up to 58 bytes, 4 are used for overhead functions, leaving 54 bytes to be used. NXT2excel only handles integers, you can send up to 27 in each message. Look in the robotc documentation for detailed information about sending and constructing messages. Alternatively you can construct and send messages using the robotc library that is provided with NXT2excel. To use this library include the file NXT2excel.c in your program. To store values in a messages you use the NXT2excelAddValue function. It takes two parameters, the first being the integer value to store, the second being the excel column number where the value should be written to. The first column is reserved for a timestamp that is automatically added to the message. Once a message is filled it can be sent using the NXT2excelSendMessage function. This function takes no parameters. By default NXT2excel uses a new and empty excel sheet to write data to. The data is dumped on the first sheet, see the first picture for an example. You can however specify an existing sheet as a template. This sheet will then be used to write data to. A template must not use the first sheet as this is used by NXT2excel. The second row of the first sheet always contains the most recent values. Row 4 and later contain the history of values. When referring to data in excel functions or graphs one should refer to the range A4:A5 and so on. This range will be expanded automatically by excel. 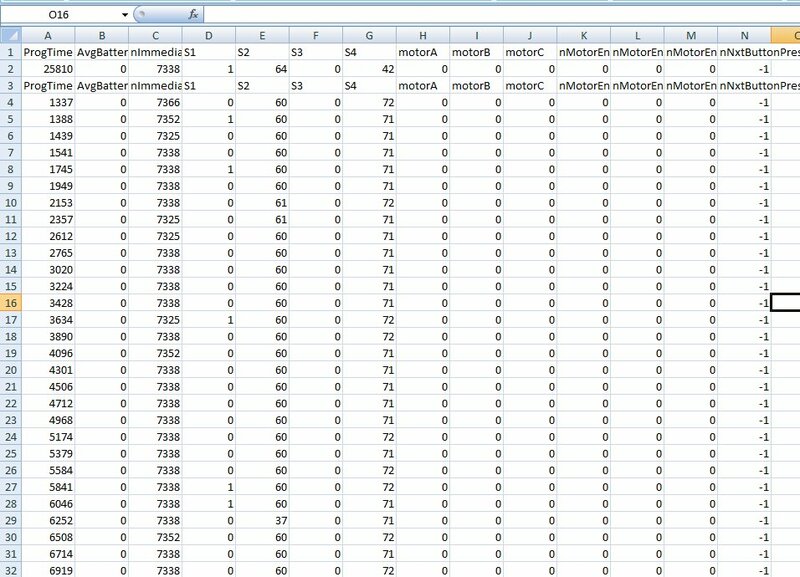 This will make sure your template keeps working with increasing number of data rows. The second picture shows some real-time graphs using a template. Please notice that NXT2excel closes excel sheets without saving them. If you want to save your data you’ll have to do so manually. The utility comes with an example program for the NXT. It shows how to use the provided source library and robotC functions. It als has an excel template that shows you how to create a template with a graph that updates as more data is fetched from the NXT. However, for now, I have no success making it work for me. I used your sample program, its being complied and downloaded to the NXT with no problems. – Pairing the PC and NXT (using RobotC “Link Setup”). Works fine, the NXT blips. – Starting the NXT2Excel application. – Opening the Excel example including in your samples. The NXT2Excel recognize it and I’m pressing “set”. – I’m choosing COM6 and Mailbox 1 (The problem might be here…) – why COM6 ? because when opening “blutooth configuration–>Client Applications–>BlueTooth Serial port (properties) – it points to COM6. However, I’m not sure that this is the right place to look at… why MailBox 1 ? because from looking at your library code, it looks like you are using Mailbox1. right ? – Using the NXT buttons I’m starting the program on the NXT side. How can I trace the problem ? How I know if the BT messages are really routed to COM6 ? Check the comments for some of the steps and contact me if that doesn’t help. Please keep in mind that only one application can make contact to the NXT at any time. So, robotC cannot be connected to the NXT when working with NXT2excel. It is however a good idea to check if other applications can connect to the NXT is NXT2excel doesn’t work. COM6 seems right in your case. But I think you have to select mailbox 0 in NXT2excel. NXT2excel starts counting from 0 to 9. On the NXT mailboxes range from 1 to 10. If this message appears you have an active connection from NXT2excel to the NXT. Indeed it doesn’t really mean that messages are exchanged. It is like making a phone connection, it doesn’t mean that somebody is talking. You can check the connection by looking at the NXT screen, the BlueTooth symbol changes from < to when a connection is made. So my guess is that you should select mailbox 0 in NXT2excel. I changed it to mailbox 0 and it still the same. I feel its the connection…. I’m getting the “connected to NXT” in the NXT2Excell even when the NXT is turned off and when I’m choosing other com ports. The BT sign on the NXT is always “<". I’ve downloaded and installed NXT2excel and can’t seem to get it to run. When I run the program I get the MS ‘this program has experienced a problem and needs to be shut down’ error window. Is this common? Is there something I goofed in the install? Hi, i’m not familiar with this problem. The error is too general to make an educated guess on the cause of it. thank you for this nice tool! very good for analyzin my PID control! what software and programming languege did you use to build it? Thanks for the response. It is good to know that people use this tool. It is written in microsoft visual basic using visual basic express edition 2008. Have a strange bug this NXT2Excel tool. This is due to the Bluetooth implementation of the NXT. If the mailboxes are full messages (the oldest) are thrown away. These is nothing I can do about it.